Well I am still terrible at posting updates but it’s my weekend off and here in Grand Forks ND it is chilly and dreary with a chance of snow so staying inside. Still the biggest challenge to moving here is getting home brewing supplies. Second would be finding a competent stainless welder, seems that welders here don’t really want to talk to you unless you are needing some sort of farm implement welded. Even with those obstacles home brewing moves forward. It’s almost been three months since arriving here and I will finally be brewing this weekend! I am going to attempt a Toasted Coconut Brown Ale, something similar to Kona Brewing Company’s Koko Brown. If you enjoy really good beer and a variety of that really good beer here in Grand Forks you have to be a home brewer. While the pub scene is improving with one college bar changing their look and feel to more of a pub and expanding their number of taps and another popular pub/burger joint has a decent rotating selection there is basically nothing unique for bottled craft or import beers here. Really sad and hard to adjust to since my home state of Washington is a thriving craft brewery Mecca and there was a very good selection of bottled national and regional craft beers as well as imports from around the world. Oh what I would give right now for a bottle or thirty of Scotch Silly or Traquair House Ale. I have been working on several equipment projects, as time allows, so that keeps me busy. This winter when temps here drop into the negative numbers I will be completing the BrewTroller control panel that will be designed to work with the two-vessel Blichmann Brutus style system or even my small electric BIAB kettle. I have decided to go completely 120V since I have seen enough proof that you can get small batches to a vigorous boil with one or two 120V heating elements. It is also nice not having to mess with 240V when you rent and have limited access to a convenient 240V outlet. Besides who wants to pull stove away from the wall every brew day just to plug in? One project I have been meaning to complete has come together after digging through my box of bits and pieces. For the longest time I wanted to be able to oxygenate my wort as it came out of the kettle or directly from the output of my plate chiller and I finally pieced together the part. 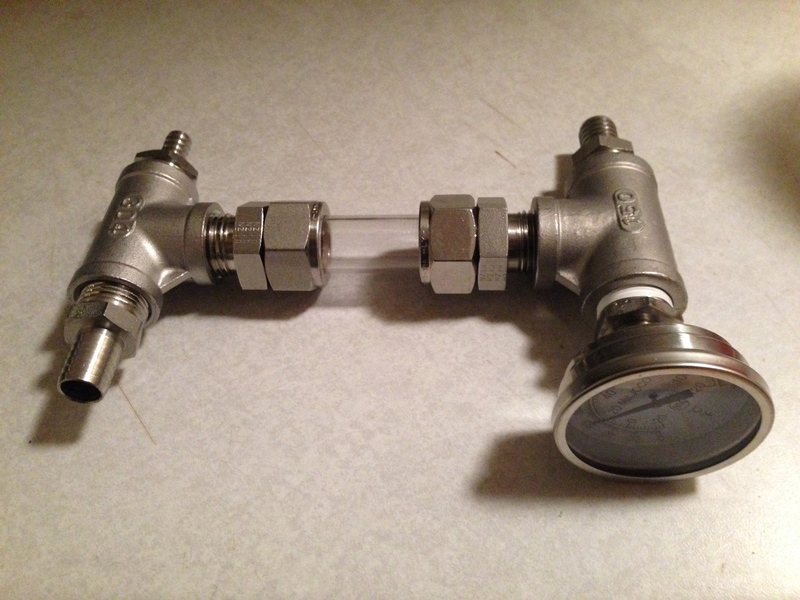 It has an 1/2″ NPT threaded aeration stone inline with the wort flow, a sight glass to monitor flow and aeration (I got to see the tiny bubbles) and finally an inline thermometer to monitor wort temperature as it leaves the chiller. With a few design changes I was able to make it fairly compact at just over 7″ long. With limited space I am trying to keep everything in my brewing fairly compact. After abandoning the Yeti cooler mash tun idea due to warping I decided to give the Aervoid thermal food carrier, that I rescued from being scrapped a try. It is similar to a big vacuum Thermos so after installing a drain bulkhead I had lost the vacuum insulating properties. 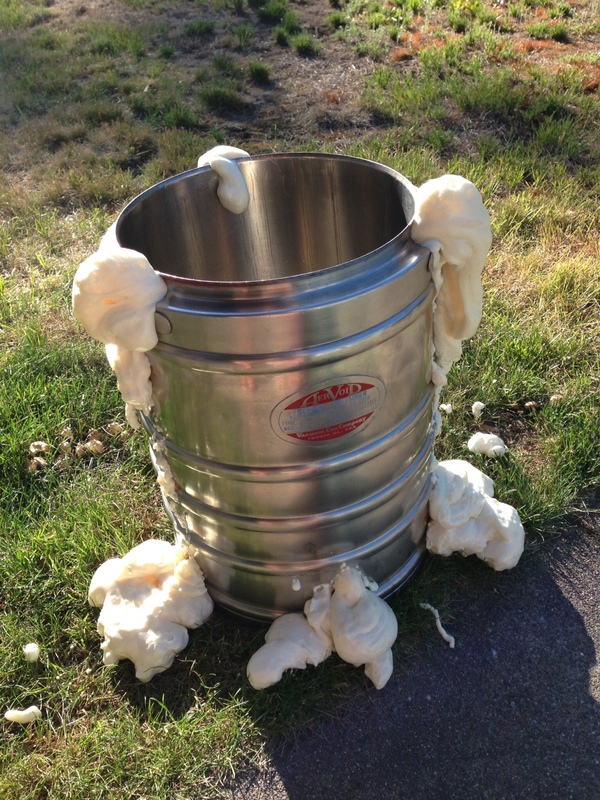 Well that is nothing 5 cans of spray foam couldn’t solve (it is absolutely stuffed with foam all around) and I was pleasantly surprised that upon testing it holds the mash for 90 minutes with zero temperature loss! Plus it will never warp. It is smaller at 4.75 gallons but if I do a smaller regular all-grain brew session and I am doing smaller batches (2-3 gallons) it will work just fine. While I have primarily moved to recirculating BIAB style brewing it is nice to have a small insulated mash tun when you want to brew it up “old school”, plus it’s stainless. 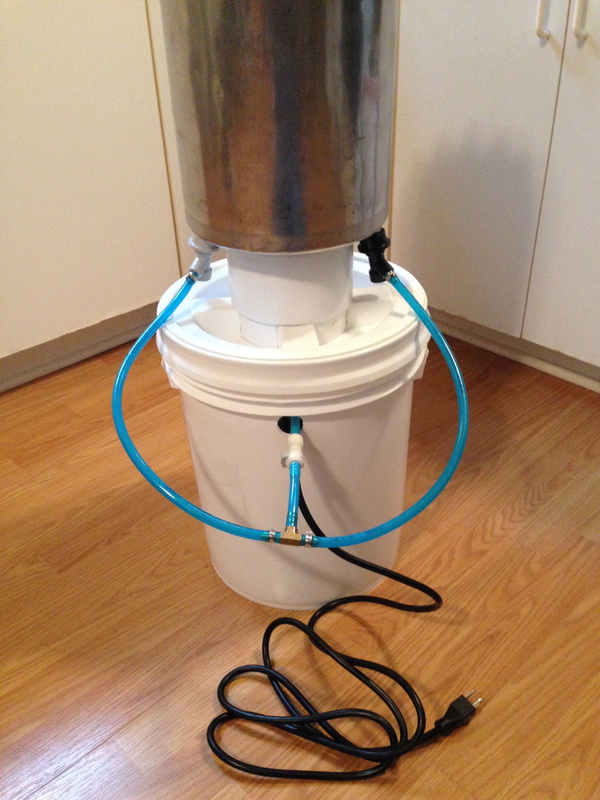 Next project that kept bugging me was redesigning the keg/carboy washer I built to better hold corny kegs. A little web searching gave me little to go forward with to change the design. After a few trips to the home improvement stores with a tape measure in hand I found it… a $3 PVC drain pipe adapter! Now a corny keg sits perfectly and stable on the washer and my carboy dryer still sits nicely over the top and you are ready to clean the worst fermentation crud from a carboy. I changed the bucket lid to a screw-on Gamma lid which proved to be much more sturdy. 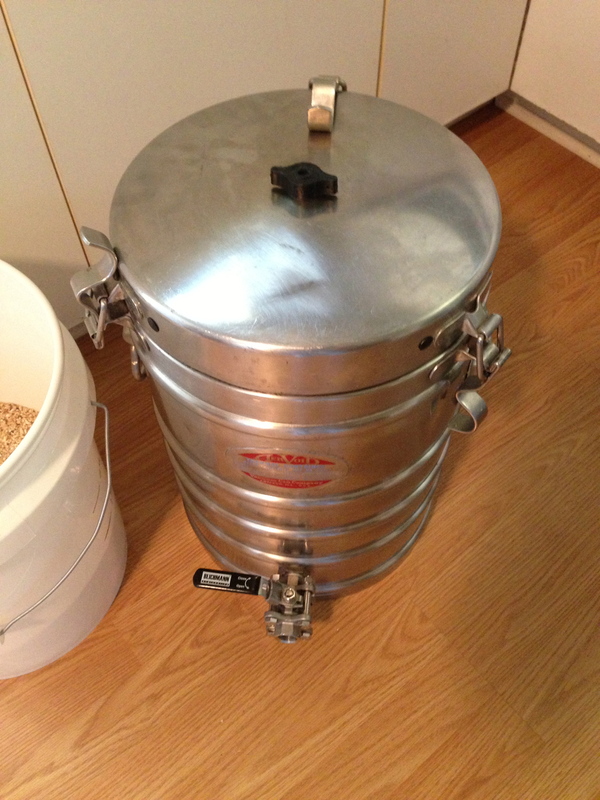 This is a multi-purpose piece of equipment that every home brewer that kegs should build. 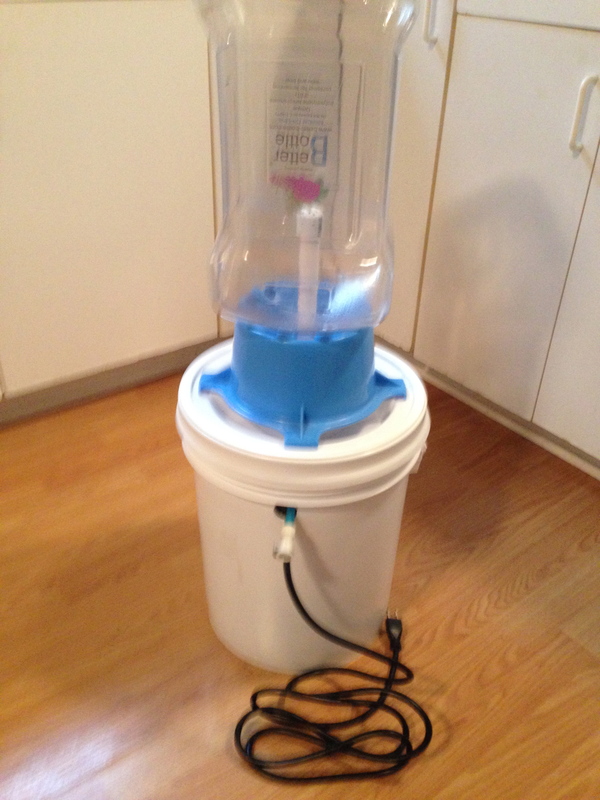 Easy and inexpensive but time saving when it comes to cleaning carboys, corny kegs and even the Sanke kegs I will be using to ferment in. Well that is all I have to share right now but I’m working on a couple more twists to the systems so check back. Now it’s time to brew that toasted coconut brown.